Mountains. There’s a distinct lack of them on the coast of Finland. Italy on the other hand has a fair amount of them, and as an invitation to visit the mountains and lakes of the Brescia Province landed in my inbox, with the promise of outdoor adventures, Italian cuisine and hospitality I didn’t need long to think if I’d like to go. A few weeks later I sat on a plane south, from Vaasa via Riga to Milano. Coming out of the airport, I realized that the fleece and hardshell where not needed, and they disappeared in my GORUCK. Driving past by the vast fields and urban sprawl of Northern Italy, soon the Alps, who’s snow-capped tops I saw just a bit earlier from a few thousand meters up high, came into view, and the smile on my face grew. As we drove through the rolling foothills, I spotted high tops & steep cliffs, and as we exit the mountain tunnels narrow valleys with picturesque villages squeezed on its sides appear, and I’m very happy to be here, indeed. We stopped in a village called Tre Capitelli on the the west shore of Lago d’Idro, in a holiday village of the same name. I was the first to arrive and had a few hours free time to explore the surroundings until I would be treated to the fine Italian cuisine. Up the mountain or around the lake, what should it be? Easy. I filled up my Osprey HydraForm, which in a wise moment of inspiration at home I threw into the one backpack I took, packed the map I got a bit earlier at the reception in my pants pocket and set off, upwards. 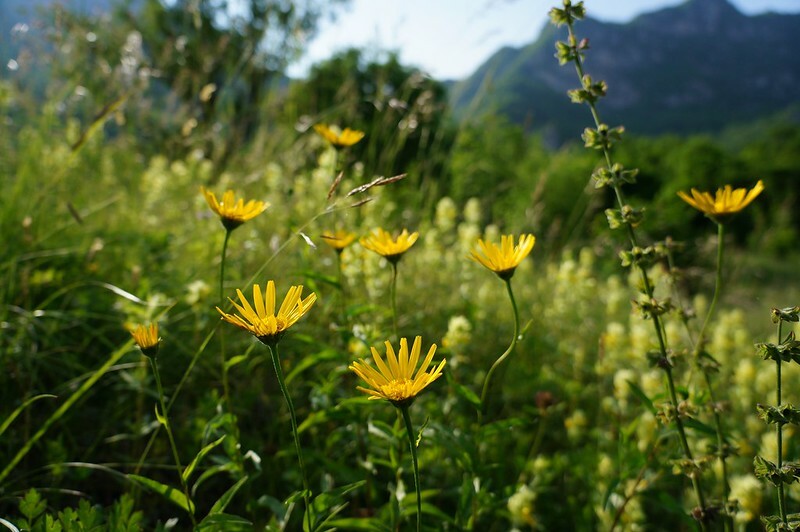 I got a bit lost on the way to the trail, and was walking up steep roads, lined with small cottages, trees in blossom and a wild variety of flowers. After having explored the wrong trail until I came to the conclusion that it can’t be the right one I headed back, took another street up and almost immediately happened on the red-white markings which indicate the trail. I had about two hours until dinner, and put on some speed in my ambitious goal to reach the ridge, a mere five hundred something meters of ascent. It didn’t take long till the sweat started running in the 26°C we had, and me realizing that fivehundred meters ascent aren’t to be made in one and half hours. I lowered my goal, and continued until six o’clock, leaving me an hour to get back down and take a shower. 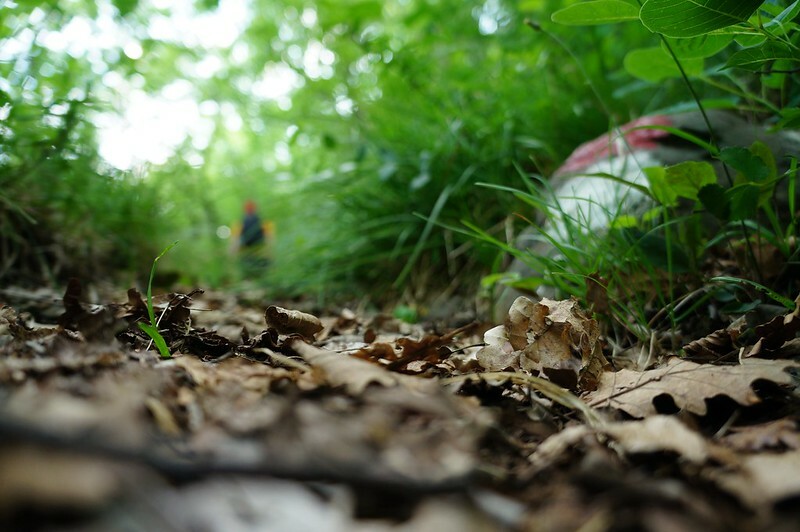 Having given up on my goal, I was able to enjoy the trail more, I felt, taking in the different scents and colours around me, listening to the birds singing. A bit after I started going down, a thunderstorm was making itself known further up the valley, and I decided I made the right move to not continue. After a refreshing shower and slipping into the other pants and shirt I brought along and having washed the sweaty one and hanging it up to dry, I commenced to the Restaurant La Terrazza, where I meet with Roberto of Brescia Tourism and Nadja from Nomad Earth, one of the other five bloggers who were invited to this trip. 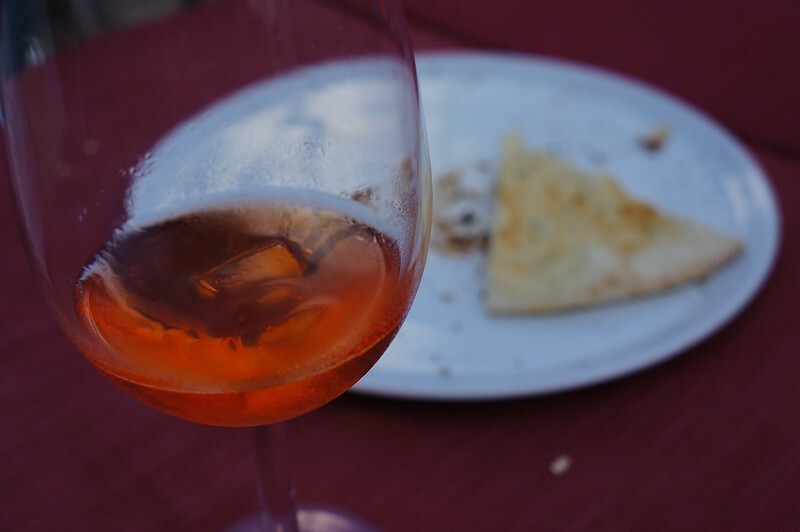 We had an Aperitivo on the terrace, overlooking the Idro Lake, and soon were having great conversations about Lago d’Idro, Brescia Province, Italy, food, blogging and life. Thursday morning I woke early, heading down to the shore to take some photos of the gorgeous, silent lake with the mountains mirroring themselves in it. At breakfast I met David of Pure Outdoor, and soon we were chatting lifely about our families and outdoor adventures, me happily listening to his tips for going outdoors with babys. After gathering our gear we headed over to Camping Azur and Surfpoint Vantone on the other side of the lake, where we took open top Kayaks for a paddle on the lake. “Do you want a neoprene suit?” asks Leo, the owner. “Nah, I don’t plan to get wet” I answer. “How about cliff jumping? We installed ropes for climbing up the cliff and jumping into the lake”. Minutes later, I’m squeezing myself into a neoprene suit. The lake is silent in front of us, but Leo assures us that in 30 minutes the wind will come up. We paddle over the lake, enjoying the gorgeous scenery. The mystique emancipating from the mountains engulfs me, wisps of cloud hanging in the neighboring valley, while a red kite circles above us and lands on the cliff. I put my GoPro HD HERO2 Camera on, climb up, and jump. The water was colder than expected, but after a few seconds the neo does its job, and it ain’t too bad anymore. Again and again David and I take turns to climb and jump, until the wind comes, as Leo said, and we decide to return. Back on land we meet Axel from Outdoorseite.de, Michael from mountainzones.com and Mario from SchoeneBergtouren.de and the group now complete, we head for lunch. While we eat we chat lively over past trips, future trips, the excellent food and ignore the rain which falls now. 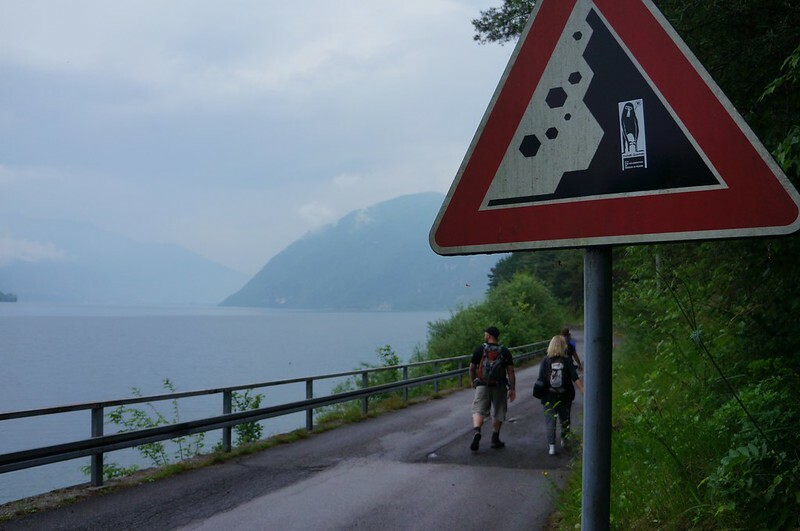 As the rain stops, and we have an hour to be in Vesta, we decide to walk there; the narrow road along the shore of the lake makes for a pleasant stroll, tunnels, forests and cliffs making the scenery interesting. At the beach in Vesta we meet Guido, an International Mountain Guide for LiberAvventura, who is going to take us via ferrata-ing up a wall, rappeling it down, and then climbing it up again. This was for me easily one of the best activities, not only because of the superb location of the rock and Guido being an excellent Guide, but because I really love climbing. All six of us enjoyed ourselves immensely, and time flew by - too fast for my taste, but then I always can come back! We walked the path back to the beach, where six mountain bikes were waiting for us, sans a cycling Guide. Helmets were equipped with GoPro HERO Cameras and soon we were on the road around the lake, cycling back to our accomodation. A fine climb made us lose our breath, and on the start of the descent I tested my frontwheel brake and caught my ensulting fall on camera, good fun! First Aid was applied to my hand, and the journey continued, down 20% steep streets, through narrow village streets back to the shore and onwards home. A cold beer was how we rewarded ourselves, before getting ready for the fine food at the La Terrazza restaurant - and excellent it was! Local delicacies were consumed, while conversation around the table was merry till late in the evening. Friday morning after breakfast we were picked up by three Paragliding Pilots, who took us in two groups of three up a gorgeous alp. While Axel, Nadja and me ran around snapping photos of the gorgeous scenery, our Pilots made our Parachutes ready for take off. Strapped in into harnesses and getting instructions on how to start, we took off; running down the alp until the wind lifted us of our feet and we were flying! Under us the roofes of tiny mountain villages, the narrow streets obscured by red tile roofs, Andrea, my pilot, hands me the straps for flying the parachute, and directs me where to go. Flying over the blue water of the Idro lake, Andrea asks if I’m ready - and upon my positive reply, we head down in a twister movement towards the lake, adrenaline rushing through my body. He pulls us back up, a short moment of weightlessness before we fall into a second twister towards the landing area. As we lost enough altitude, we go back to smooth sailing, and to quickly I’m back on my feet again, a massive grin on my face. The other three guys head up the alp to take their flights, and we wander around at the landing space, waiting to see their parachutes appear in the sky. As also they have landed, Guido is appearing, and brings us over to the Garda lake, where we will spend the afternoon. But first, lunch at Rimbalzello. Nothing beats the Italian cuisine, and satisfied and strengthened the seven of us head over the street to the Adventure Park, where we complete the “difficult” route in no time. This was just the warm-up, though, the real highlight was yet to come. We drove onwards, passing the busy shore towns of Lake Garda, and took a left, driving serpentine roads up the mountain. 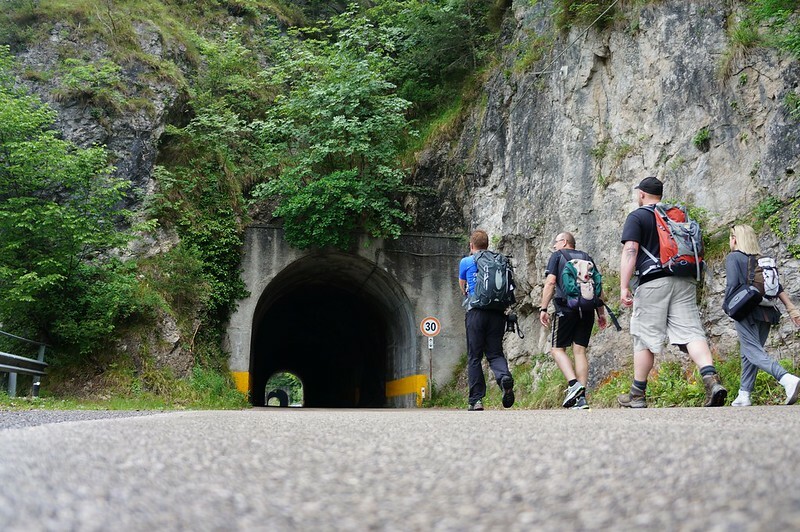 As we stop, Guido hands us neoprene suits, neoprene boots and a harness, which we all put dutifully on, before commencing on a hike over lush forest paths, leading us further down the gorge. Hiking in a neoprene suit at 27°C is a great way to lose weight, btw. But soon we arrive at the cool, refreshing stream which has formed deep pools, slides and waterfalls on its way down the valley over the thousands of years it runs down here. 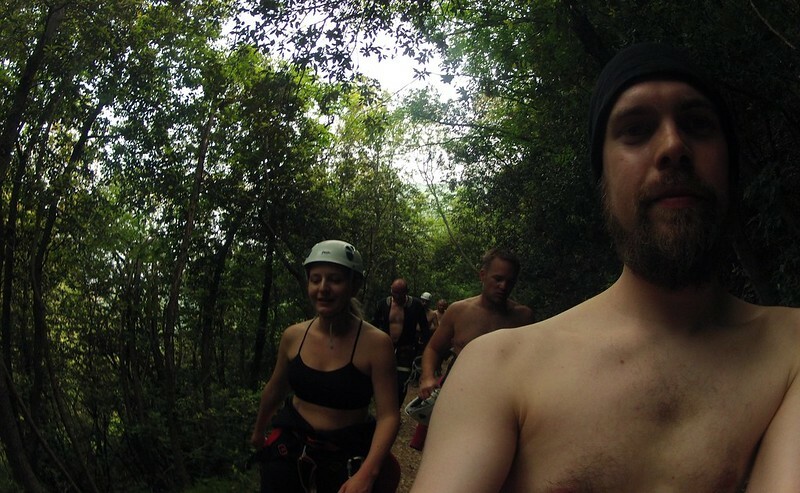 GoPros are switched on again (resulting in a outtakes video of “Is my camera on?” scenes) and then it is off down the canyon, doing some serious canyoning. 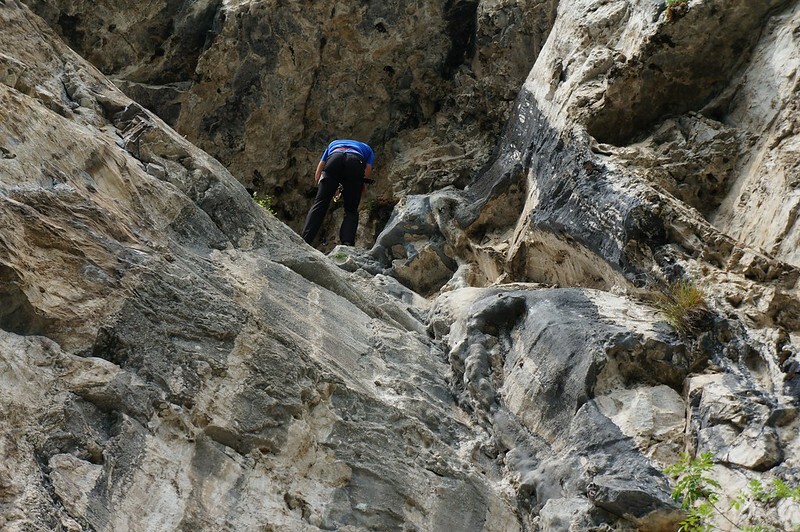 We start easy, if you consider rappeling down a waterfall easy, that is. 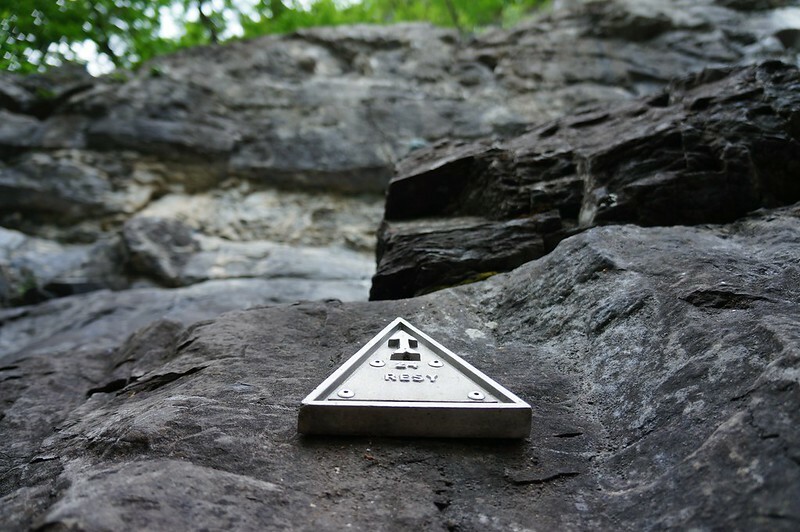 Guido tells us when it is safe to jump, how and when to slide down a chute, and belays us when we rappel down. The jumps and rappels get longer and longer, and at the biggest jump, some ten meters over a waterfall into a deep pool, it is Nadja, the only girl, who jumps first & shows us guys how it is done! And so we travel down the canyon, swimming in pools, seeing the gorge how you can only see it if you travel it down this way. At the longest rappel and slide, some 50 meters of descent, a green roof engulfs the deep pool in which we land, a great place for a swim. As we’re all safe down, we continue onwards, jumping in pools and sliding down more chutes, until we arrive at the take-out; where a police woman waits for us; Guido produces his ID and she checks it, as well as if this trip has been declared - there are unauthorized groups with dodgy equipment offering tours down the canyon, and Guido tells scary stories of how people with electrical wires in jeans where attempting to do what we just did. We ride back to the Café where we slip back into our dry clothes, and drink a cold beer, remembering the experience. Sitting in the hot sun, we soon wish back the cold pools for some refreshment, but we head on, to the Zanzanu Hotel, for a shower, as the sun already is slowly sinking toward the mountains in the west, casting long shadows over the Lago di Garda. We ride to the gorgeous Agriturismo Al Lambic restaurant, and seated in a thousand year old cellar I enjoy the best food yet on this trip. Local cheeses, house made chestnuts Tortelloni with mountain butter and Tiramisù make for an perfect dinner. We all chat lively about the past days, in which we squeezed a great amount of exciting outdoor activities; and how we plan to return with our families in the future. Back at the hotel, we sip a final beer on the terrace, overlooking the silent Garda lake, illuminated at the shore by lights from villages, street lanterns and the moon. Tomorrow we are all again on the way back home, to Austria, Germany and Finland, but the memories of Lago d’Idro and Lago di Garda will stay with us for a long time. So what was the best thing on this trip? While I am tempted to say rock climbing & canyoning, it really were the people who made this trip so great. Meeting Roberto, who did a superb job in organizing this trip for us, and Nadja, Axel, David, Michael & Mario was a pleasure and I dare say we were a great group who had a great few days. Guido was one of the best guides I have meet; the staff at the hotels and restaurants was a prime example of Italian hospitality and friendliness. More Photos. 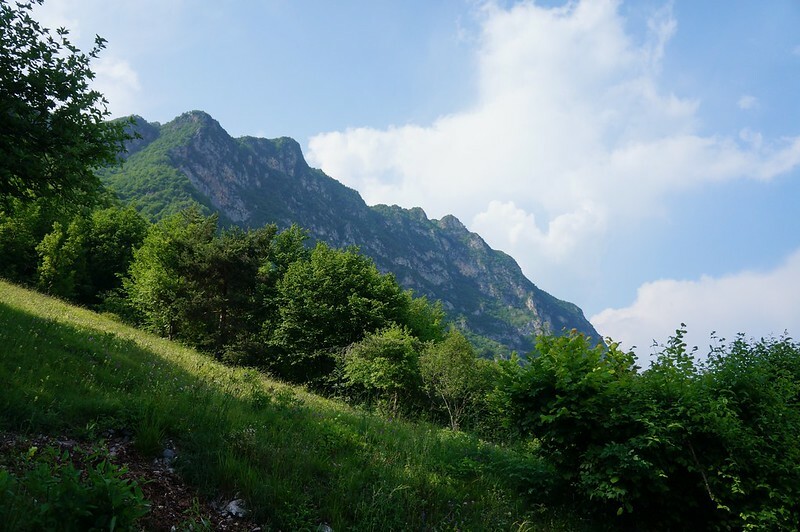 Adventures around Lago d'Idro - Teaser from Hendrik Morkel on Vimeo. A full short movie is coming soon-ish - check the Teaser above to get a taste! Getting there: All major airlines fly to Italy; the nearest airports to Lake Idro are Milano and Bergamo, from where you can get with the a bus or taxi to Lago d’Idro. 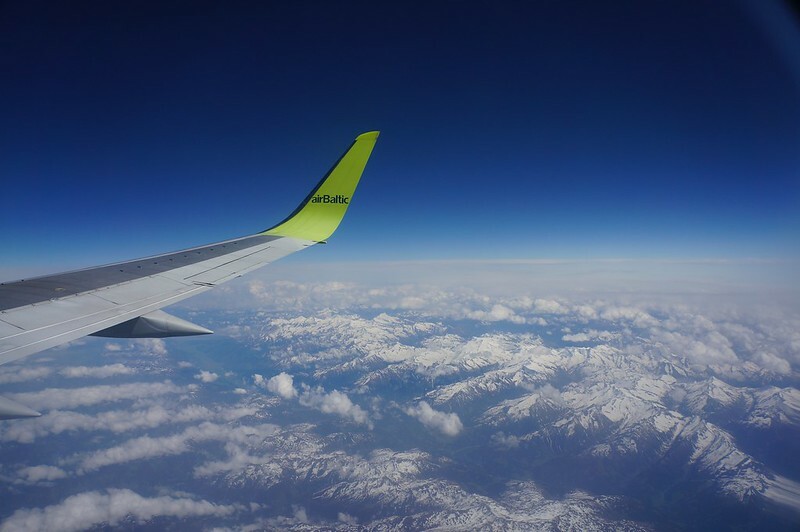 Check Hipmunk for flights; I flew with airBaltic who were punctual, had friendly service and flew directly from Vaasa. Staying there: There are various accomodation options around the lake, from camping places over holiday cottages to hotels. 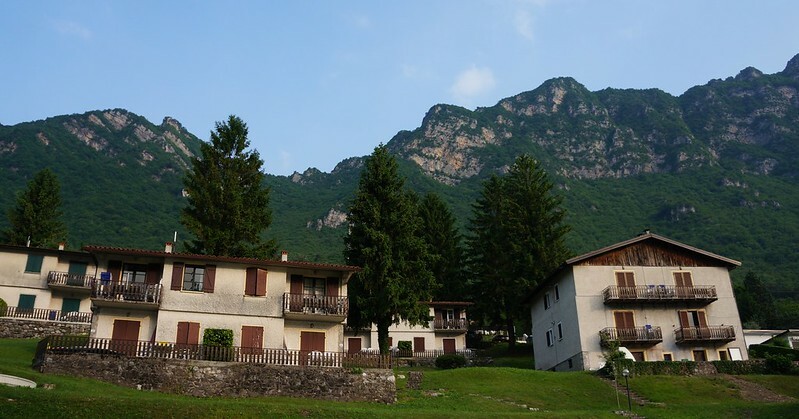 Villagio Tre Capitelli was a very friendly place in a great location, and would work great as a basecamp for outdoor activities around the lake. 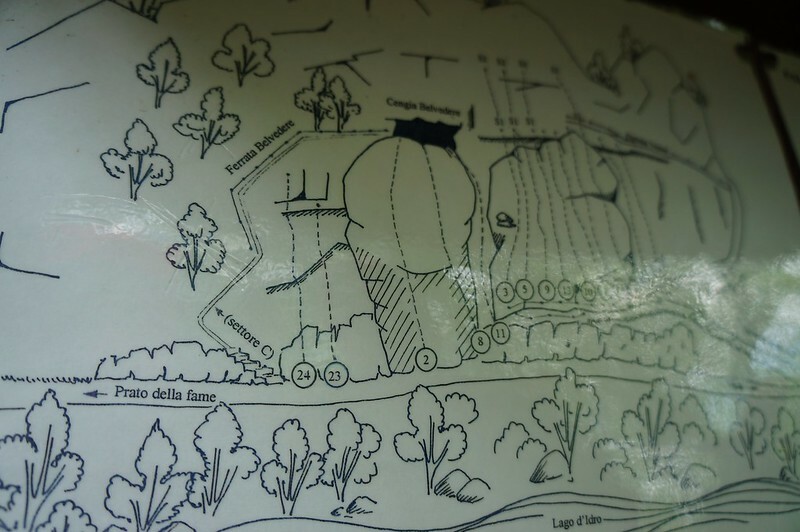 They offer a guided mountain walk up to the ridge behind the village. On the east side of the lake_href=”http://www.azur-camping.de/nord-italien/idro.html”target=”_blank”>Azur Camping</a> offers camping possibilities for those who rather go that route; they also have modern Mountain bikes for rent, as well as open top kayaks & a surf school. Full list of Lake Idro accommodation possibilities. 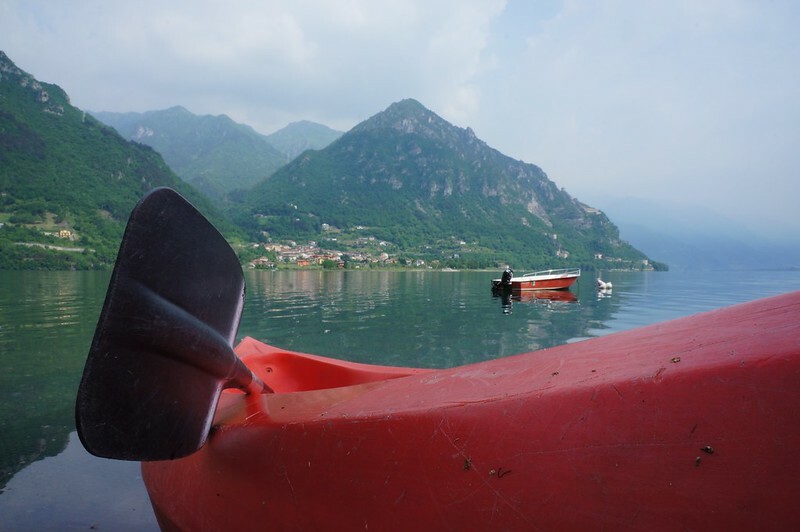 What to do: There are plenty of great outdoor activities available at Lago d’Idro and Lago di Garda. 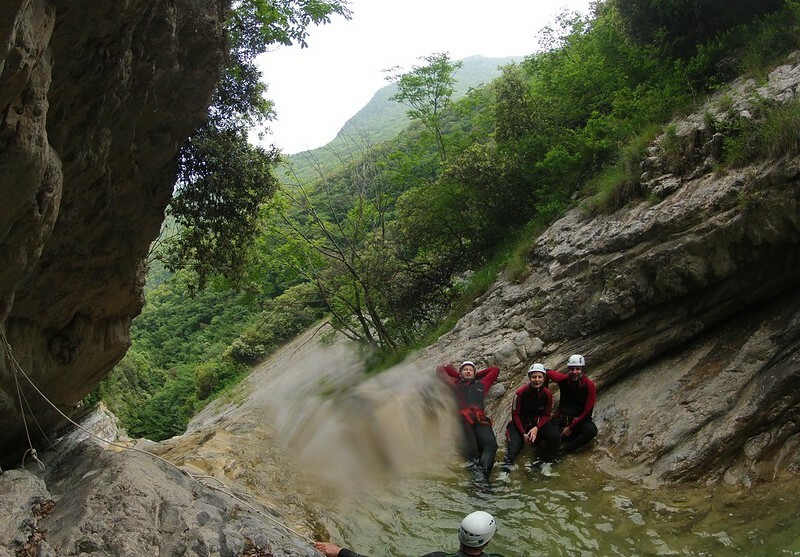 My recommendations are Canyoning and Rock Climbing, and with LiberAvventura you will be in friendly and professional hands for these activities Guido’s English site. Rent a mountain bike and explore the mountains with pedaling power, or get a kayak and see the lake & mountains from the water. If that’s too much using own energy, go paragliding and see the area from above; which definitley will be something you will remember. Andrea, Alberto & Giulio have thousands of flights amongst them and will treat you to a very special experience. Eating: Going to Brescia Province you want to taste the local food, which, in case you didn’t get that yet, is superb. 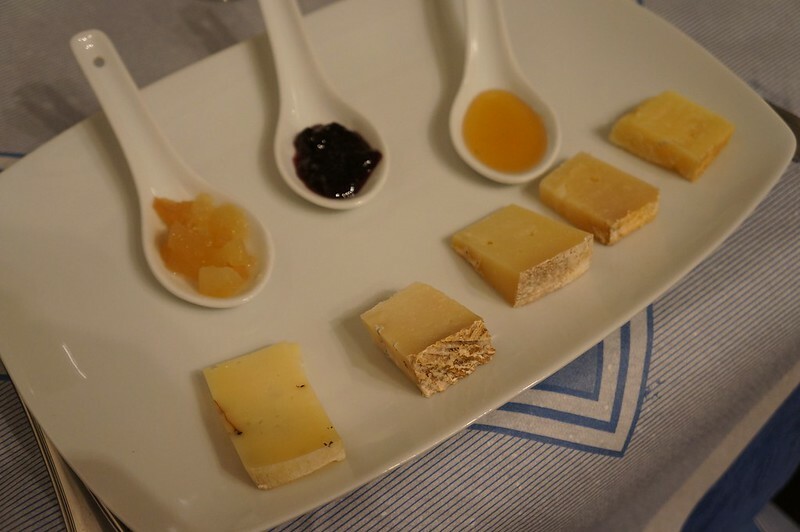 For me the Italian cuisine is the best in the world and this trip was a pleasure in culinary terms. 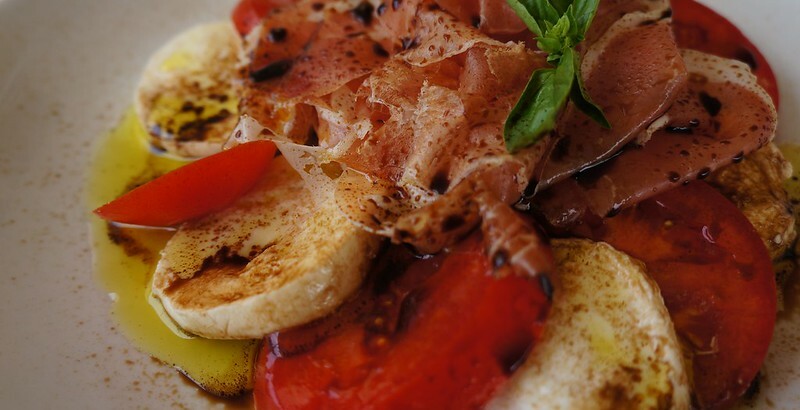 From the excellent cheeses from the region over the cured meats to the tasty fresh salads, make sure to experience the full Antipasti, Primero, Secundi and Dolci Menu. 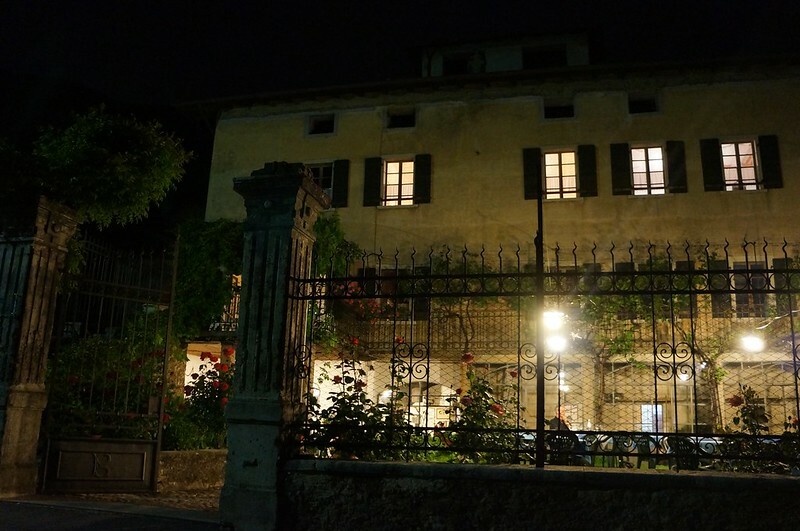 I can highly recommend the Restaurant Agriturismo Al Lambic which is one of the secret tips of the region and is popular with locals and visitors alike. Best of all is that eating out in the region is very affordable, a delicious three course meal will usually not be more than 25€ excluding drinks. Lago d’Idro and Lago di Garda: While Lago di Garda is a big lake with a Mediterranean flair & temperatures, touristically fully developed; La_‘Idro is a small lake which you can’t even completely drive around. 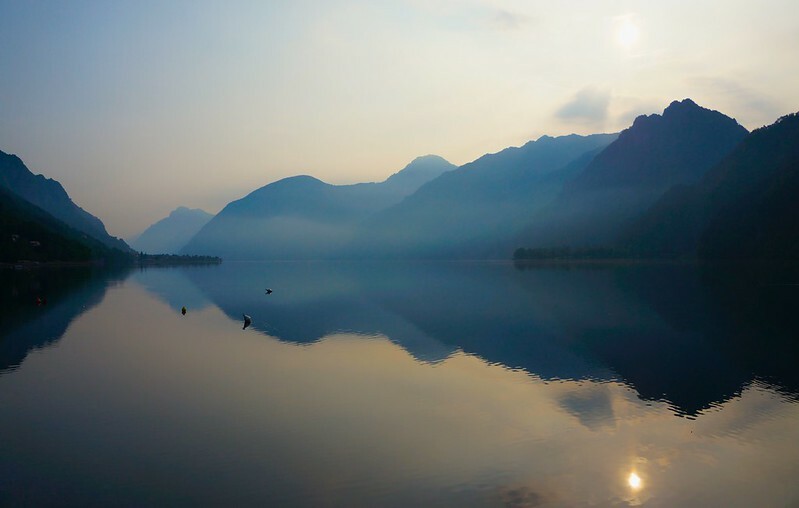 Idro lake is a lot more relaxed, with less bustle, and is excellent for those people who want to do outdoor activities in a calm atmosphere; while Garda lake offers you activities around the clock. Both have plenty to offer, you just need to know if you want it more relaxed [Idro] or want more possibilities and night life [Garda]. In the end they’re only about 45 minutes by car apart, so you can experience both if you’re in the region! What else: Italy has the Euro and is for us Northern Europeans very affordable & offers great value for your money. Italians are friendly and _pful, even if they do not speak English, and Italian hospitality is something to experience. If you look for a bit of variety between your outdoor adventures, then the amount of culture the country has to offer will not disappoint you. Wa_hrough narrow conblestone streets in villages and towns which are many hundreds of years old, visit old castles towering over medival cities and museums. Sip an espresso on a terrace of a Café, or eat an ice cream while walking along the shores of the lake. Disclaimer: The five other bloggers and me were invited by Brescia Tourism to this trip, and they paid for our transporation, food, accomodation and activities.